scene becomes overwhelmingly blacker and his understanding of it more tenuous. Hard-up for bucks, he moves into the maid’s room on his property and rents out the main house. Sizwe arrives and swi ly sets about taking over Disco’s life. He impregnates his ex-girlfriend Jazz, founds a rival scene magazine and slides into a job Disco had his eye on. Are blacks are taking over! Disco finds a black girlfriend, but even that doesn’t stop it. Desperate for relevance, he resolves to get famous somehow. But who even needs white celebs any more? 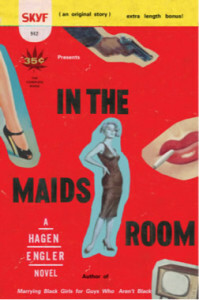 In the Maid’s Room is Hagen Engler’s third novel.